RAWA has been campaigning to try the warlords for war crimes at some international tribunal. It is the woman who bears the brunt of war. Man at war front dies once. The woman left behind dies inch by inch. The Afghan woman is dying this death for last thirty years. Every now and then she is focus of the global media as western journalists land Kabul like vultures. Blue burkas and mud houses are flashed on front pages. Then vultures leave in a hurry since there are more juicy stories elsewhere. The heart of some first lady in Washington or London aches for Afghan woman too when war budgets need a justification for a hike. Once Uncles Sam and Bull are upset that infidel Commies are encouraging Afghan woman to shed burka. Next time they want to bomb Kabul on the plea that faithful Taliban have imposed burka on Afghan woman. Undeterred by the “international community’s” political exigencies, the Afghan woman has not given up her struggle for peace, democracy, liberation as well as her right to education, health and work. Nowhere, perhaps nowhere in the world, one finds a woman as keen for education as an Afghan woman. 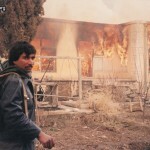 And embodiment of this struggle is RAWA, the Revolutionary Association of the Woman of Afghanistan. Alerting the world since 1977 to the sufferings and struggle of Afghan woman, RAWA is the only woman, if not political, formation to have survived 30 years of Afghan war. An achievement in itself. ‘There is no organization on earth like it’, says John Pilger. ‘It is the high bar of feminism, home of the bravest of brave’, he declares. 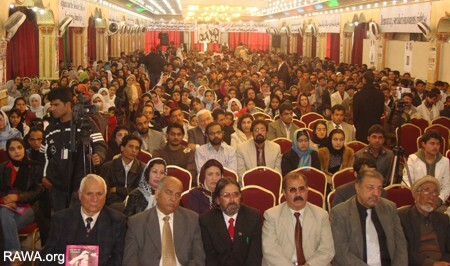 Pilger’s observation was confirmed on March 8, 2008 as RAWA activists and supporters, forced to work clandestine as RAWA is illegal in Afghanistan, turn up not in their hundreds but in thousands to flock Almas-e-Sharq wedding hall to mark March 8. Wedding hall because it is only wedding halls available for gatherings where one expects guests in their thousands. It was not only RAWA mobilizing its activists to mark March 8. Dozens of other women rights groups across Afghanistan, particularly in Kabul, had organized meetings, in one case a demonstration, while the Karzai government (ironically run by the very fundamentalists who are held responsible for Afghan woman’s plight) also had arranged couple of activities. At one such function, Karzai addressed bussed-in spectators. The function was telecast on state-run RTA television. The audience was seen chatting among themselves, giving a damn to what Karzai had to say, while waiting for a sumptuous lunch usually served at such official hypocrisies. To Karzai government’s credit, the woman commuters boarding state-run buses in Kabul had a nice surprise awaiting them on March 8. Women commuters were not charged any fare (Attention SL!!). Media, both electronic and print, generously devoted time and space to highlight March 8. But songs, slogans and statements were mere a boring repetition of clichés: ‘Woman is a mother, sister, daughter’, ‘Good mothers, good society’, ‘Educated woman, healthy family’. The slogans were not very different either at another function this scribe happened to attend, jointly organized by nine NGOs, at Morwarid wedding hall. The function among others was addressed by Masooda Jalal. Former woman minister Masooda Jalal, is a household name in Afghanistan. She also contested presidential election. In her brief speech as well as talk with Internationalen, she criticized Karzai government for not fulfilling the promises made at international conferences regarding the uplift of woman status in Afghanistan. Talking to Internationalen, she insisted upon the implementation of constitution ‘which is woman supportive’ in letter and spirit. ‘At Berlin conference, similarly at Tokyo and London conferences , the Afghan government promised to take steps and introduce positive discrimination to help Afghan woman improve her status but six years have passed since and nothing has happened to deliver these promises’, she regretted. Asked who she thinks is responsible: Karzai government or ‘international community, she said: ‘The international community delivered what it promised. It promised political, diplomatic, moral and technical help. All that was delivered. What however, international community failed to do was monitoring and supervision of the whole process’. She thought all the help from abroad should be linked to woman participation which should be obligatory upon the Afghan government. She was also critical of the ‘international community’ that had lent support to men politicians instead of women politicians. Back at Almas-e-Sharq hall, demands, criticism, slogans, songs were all in strong contrast with clichés repeated by media or officials. Unlike songs praising mothers and sisters telecast by host of TV channels, students from RAWA schools were singing: ‘Kabul Kabul, Kabul-e-Zeba Kabul. Kay kar dat dasmanan att weran wa nashad kabul’ (O beautiful Kabul, enemies have destroyed you and made you unhappy). The slogans here were militant, mood sober and speeches hard hitting. Faiqa, 19, soon to join Kabul University to study journalism, was the main speaker. ‘Help us’; she was urging the world, ‘to bring war lords to the dock’. She wanted notorious war lords to be tried for war crimes by some international war tribunal. The chants here at Almas-e-Sharaq were equality, liberation and democracy. A large portrait of journalist, presently on death-row, Perwaiz Kambaksh placed on the stage reflected RAWA’s commitment to democratic rights. Kambaksh is accused of spreading anti-Islam propaganda. Still a student of journalism at Mazar-e-Sharif University, Kambaksh is punished for his brother’s ‘crimes’. His brother, also a journalist, is guilty of criticizing the war lords. An excellent play (Justice), highlighting Kambaksh’s situation was also staged at the end of the function. RAWA has been campaigning to try the warlords for war crimes at some international tribunal. According to Faiqa, Afghan judicial system can not be trusted and ‘we must set an example by bringing war lords in the dock’.